Community sanctions are often a much better option for women than a prison sentence, but like many other aspects of criminal justice systems, it is usually set up with male offenders in mind, paying little attention to the reality of women’s lives. 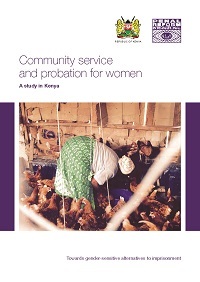 This report produced in partnership with the Kenya Probation and Aftercare Service examines the context in which women serve community sanctions (Community Service Orders and Probation Orders) in Kenya and their interactions with and experiences of it. It identifies challenges women face (how do they balance serving the Order with childcare commitments and their casual jobs, for example? Are their health problems taken into account when allocating work? Do they feel safe?) and what they need to maximise their chances of successfully completing the Order, and makes recommendations for improving the gender-sensitivity of the community sanctions system. This report was produced as the first step of a project to develop a gender-sensitive approach to the delivery of community sanctions in Kenya and was funded by the Thailand Institute for Justice. Watch our short film made to accompany the film. Also, read a briefing outlining lessons and recommendations for other countries to implement community service and probation for women, in line with the Bangkok Rules.